Zhang San Feng, also known as Zhang Jun Bao was born in Liao Dong in the late Yuan Dynasty. His ancestors and parents lived in Longhu Hill, Jiangxi Province. His father was an expert in telling fortune by watching stars. As he predicted there would be good fortune in Liao Dong, he moved there before Zhang Jun Bao was born. At the age of five, Zhang Jun Bao suffered from an illness and lost his eyesight. His father heard that some Daoist priests in a Daoist temple had an incredible way of curing illness; so, he took Zhang Jun Bao there. Within a week, he was cured and the whole family was more than happy. The Daoist priest loved Zhang Jun Bao and took him as a disciple teaching him both writing and martial arts. Like all fathers, his father wished him every success. Zhang Jun Bao was expected to take the state exam for a career in the government. However, he was not interested in becoming a politician or minister. He loved martial arts and visited many ancient temples. When he came to Yan Jing, he took up a local government post through the relationship of a good friend. Since he did not enjoy this kind of life, Zhang Jun Bao quit and returned to Liao Dong where he spent most of his time in a deserted temple..
One day at the temple, a Daoist priest approached him. They talked throughout the night, and treated each other as old friends, regretting not having met earlier. As they parted, Zhang Jun Bao missed living a life of solitude, wanting to be free like the clouds and birds. He spent the next few years visiting various places, learning martial arts and becoming famous. When he was visiting ShanXi Province, he realized that the Daoist priest he met earlier was Qui Chu Ji, the disciple of the renowned Wang Chong Yang. Zhang San Feng came and went without shadow. Settling down in Wudang Mountain, he was inspired by watching a snake fight a bird. He thought about martial arts, learned advantages from others, and combined Daoist fighting techniques in order to create the Tai Ji Quan 13 style. 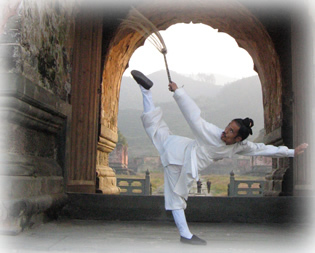 The Tai Ji Quan 13 style, also known as Nei Jia Quan or Wudang Nei Jia Quan, has formed the basis of Wudang Internal Martial Arts.